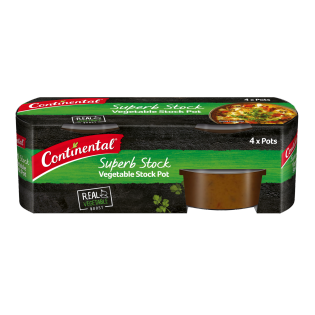 Continental Vegetable Stock Pot is a rich, concentrated, premium stock that tastes just like homemade stock, and is so versatile. Carefully selected vegetables, herbs and spices are gently simmered into a flavoursome little pot which melts easily into hot water for a full flavoured stock, or can be added straight to your dish to boost its natural flavour. One pot makes 2 cups of liquid stock. Concentrated vegetable stock (59%) (vegetables(carrot, onion, capsicum, leek, celery, garlic), water, herbs, spices), salt, vegetable fat (contains tocopherols), sugar, yeast, flavours (contain wheat, milk), thickeners (xanthan gum, locust bean gum), burnt sugar (contains wheat), natural colour (carotene).